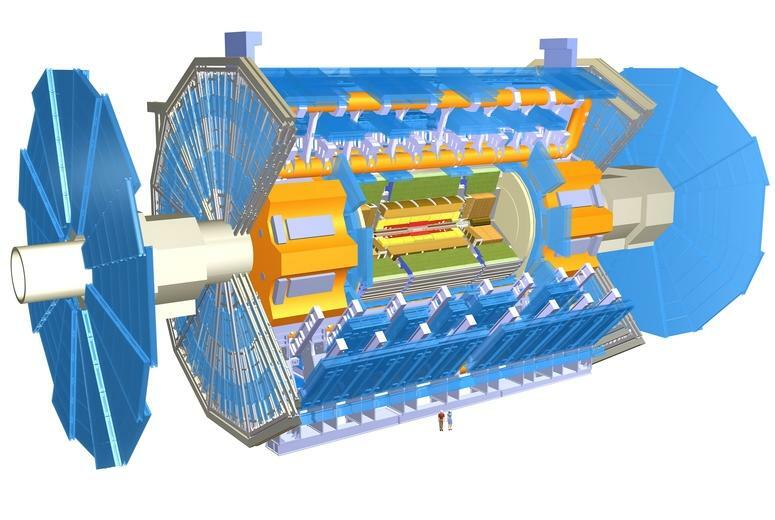 A new ATLAS search for supersymmetric signatures in 2011 LHC data has appeared last week in the arxiv. The result ? No hint of a signal, not even for ready money. 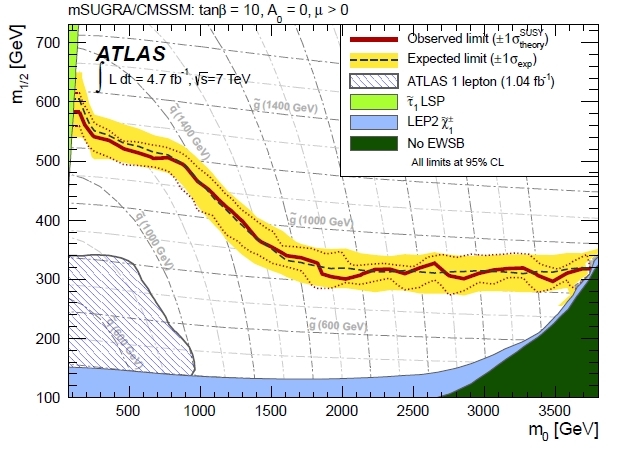 So if you are on a hurry, you can just have a glance at the graph below, which summarizes the measurement in terms of excluded regions of a slice of the complicated parameter space of SUSY theories…..
ATLAS: 5.9 Sigma For A 126 GeV Higgs ! 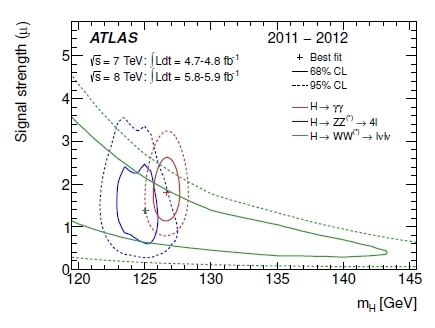 ATLAS has just released a note which summarizes the searches for the standard model Higgs boson in 7-TeV and 8-TeV data. Since July 4th the main improvement is the addition of the WW channel, which had not been shown back then. With it, the combined local significance of the 126 GeV Higgs boson excess in the WW, ZZ, and γγ channels grows to 5.9 standard deviations. In the words of a Facebook friend who’s in ATLAS: “if this is not a discovery, I don’t know what is”. So, due congratulations to my ATLAS colleagues for this new important document. The paper is indeed full of detail about the searches, answering many of the questions that the format of the July 4th event did not allow to be asked. The most important measurements, those of mass and cross sections, are summarized in the figure on the right, which shows the 1-sigma contours for the different final states: the WW measurement is the one which extends the most in the horizontal axis, because of the large indetermination in the mass due to the escaping neutrino pair. The three measurements are consistent with each other, and the global signal strength is measured at 1.4+-0.3 times the standard model predictions for a 126 GeV Higgs boson…..